I've been out of town for the last two and half weeks and didn't plan far enough ahead to have lots of interesting posts scheduled for my absence. I returned to a fairly clean house (had enough time to plan to clean before leaving) but am now catching up on all the laundry. Wow, two weeks worth of laundry plus the entirely full hamper that I left for later and it's still not done. Rather than attacking it non-stop I took a little bit of a break to check out the Twilight movie. I've read the first two books and will get to the third one soon. You know it's always interesting to see a movie based on a book - especially if it's a book that I really enjoyed. Somehow I'm always a bit disappointed. Oh, don't get me wrong, the movie was pretty decent. It's just that I didn't feel the same intensity between Bella and Edward that you get from the book. I'm undecided whether this is purely on my part or whether the actors weren't 100%, or if they didn't have enough of the movie's time to devote to that before getting to the action of the book. I still walked out of the movie theater with an overall good feeling about the movie so it's not all that big of a deal. Still, when it comes to movies based on novels, my first love will always be the written form. The soundtrack was enjoyable to hear. Oh and they did an outstanding job with the ballet studio scene. That did live up to expectations very well. If you're a fan of the series then go and see the movie. Let me know what you thought. Perhaps I'm being a bit too harsh. I do wonder if they already have plans for the sequel? 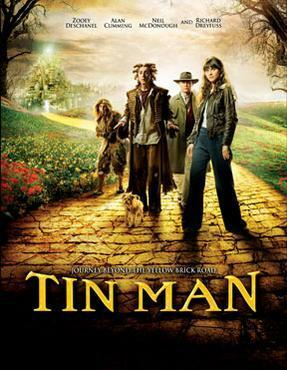 Did anyone watch Tin Man, SciFi channel's darker version of The Wizard of Oz this past week? Lucky we have TiVo to record all three episodes when they repeated at 1am each night. The imagery was brilliant. Who would have thought of transforming the flying monkeys into monkey bats that live as tattoos on the evil witch? The colors are rich with dark undertones. It's almost as if all the colors were painted on a black canvas. There's a nice contrast between dark areas and light, sometimes blending into subtle shadows. The scenery mirrors the characters who aren't classic good/evil or black/white. They're all too human with flaws, both small and great. I fondly remember the times that I watched the original movie but this new incarnation is definitely not to be missed. I think that it repeats again this Sunday.